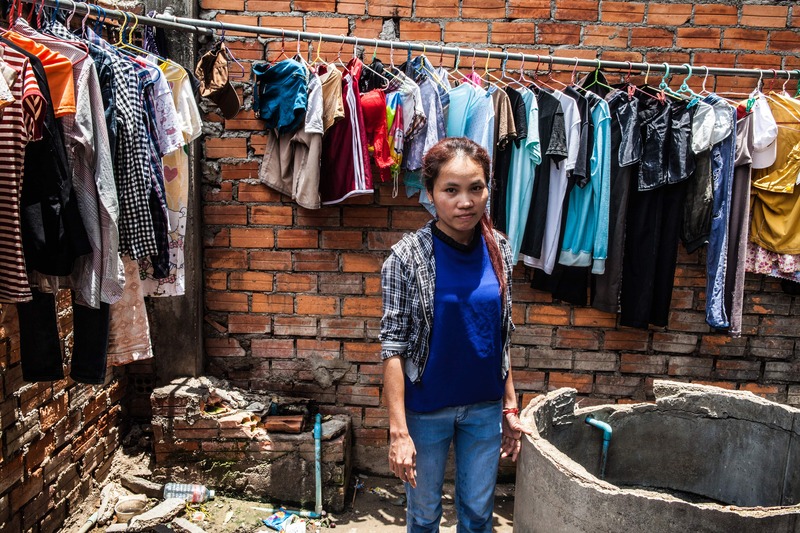 Kim Sopha is 33 years old, a union leader and garment worker for nine years. Kim works Monday – Saturday, 7.30am – 4pm with overtime until at least 6.30pm. She usually works 4.5 hours overtime a day. Her only free time is when she is sleeping. I have no choice but to work in a factory because it's difficult for me to find a job. The wage is $128 per month which is not enough. The price of goods are increasing but our salary is not. If we don't work overtime we don't earn enough money to eat. It is hot in the factory and we can smell the colouring chemicals. We don't eat enough and it gives us headaches and sometimes we faint. Kim is studying after work to improve her sewing skills and wants to run her own business out of her home. “I always work overtime until 8.30pm, then I come home and tailor until midnight, then I can finally sleep. I’m really tired but this life is my reality. I hope I can have a better future”.